Since Kate was diagnosed with Alzheimer’s seven years ago, I have read quite a number of personal experiences with the disease. Most of these have been written by caregivers of a family member with Alzheimer’s, a smaller number by people with it. It hasn’t surprised me that despite having certain things in common, people (both caregivers and their loved ones) respond to the disease in very different ways. Throughout our own journey, I have tried to be sensitive to this fact. I’ve tried not to write as though others’ situations, experiences, and responses are like our own. Even within a family, there are often differences. Let me tell you about Kate’s brother Ken. In October 2013, two and a half years after Kate’s diagnosis, we learned that he, too, was being tested for Alzheimer’s. They received the diagnosis in November of that year. He is a little more than two and a half years younger than she. That means he and Kate received their diagnoses when they were about the same age. He and his wife, Virginia, live in San Angelo, so we don’t see them very often. We have, however, tried to visit them each time we visit our son and his family in Lubbock. In addition, Ken and I talk periodically by phone and also exchange email messages. From the outset of their diagnoses, Kate and Ken have approached their situations quite differently. Kate has always wanted to be very private. Other than Ken and Virginia, she has only told one other person about her diagnosis. That was her best friend. Kate hasn’t wanted to join a support group or read anything about Alzheimer’s or other people’s experiences with the disease. She has simply wanted to live her life as normally as she could. In the early years, she experienced a good bit of frustration from her memory lapses and difficulty completing tasks like working on the computer or dialing numbers on the phone. She has thought a lot about Alzheimer’s, but she has not wanted to talk much about it. We have only obliquely approached the subject. Nowadays, we never mention it. I don’t believe she thinks about it at all except when we go to her doctor’s appointments. She had her latest appointment a few weeks ago, and nothing at all was said about Alzheimer’s. I believe she still recognizes she has the disease, but I don’t believe she associates it with any special problems she has. I never mention it to her. At this point, I don’t see any benefit in her fully understanding the disease, where she is on her journey, and what lies ahead. Ken, a retired psychology professor, has approached his diagnosis differently. Shortly after he was diagnosed, he informed his family and close friends. He found a support group of others who have dementia and continues to participate in it. He once appeared on the TV news in San Angelo that featured his group. I’m not sure whether it is his background in psychology or his personality or both that account for his approach. He has also been more deliberate in learning more about Alzheimer’s, ongoing research on the topic, others’ experiences with it, and exercising his brain. Since I launched this journal as a blog in January, Ken and I have had phone conversations and emails about ways that we might include his experiences and approach to Alzheimer’s within this blog. I don’t think either of us knows exactly where this might lead, but we are going to take a first step. With that in mind, I thought I would first give you a glimpse of him via a letter he wrote to his sons. The letter, which is copied below, was written in January 2014. This was very shortly after he had received his official diagnosis. He had previously informed them by phone of his test results. This letter was the first in a series of annual letters in which he provides updates. I may share the others in subsequent posts. Let me point out several ways Ken has responded differently than Kate. Ken informed his children very shortly after he knew the diagnosis. He and his wife, Virginia, had been with us in Knoxville in October to celebrate my dad’s 100th. At that time, he told us that he was undergoing testing. That was completed in January. After we got the word from Kate’s doctor, we kept the information to ourselves for a long time after that. It was three years later that I told our children because I thought they needed to know. He was already thinking about a support group and exercising his brain with his photo albums and Lumosity. He considered some of the most disturbing manifestations Alzheimer’s and wanted to protect Virginia from any potential aggressiveness he might display. He wanted to clarify his preferences about his care and his desire that she be able to spend her summers in Michigan as she has done for most of her life. Here’s the letter to his children. Virginia and I had a recent meeting with our neurologist to update my diagnosis and discuss strategies for the future. He again went over the lab results with more detail, but you already know the general essence of the findings. To summarize, the results show that I do indeed show clear evidence of mild Alzheimer’s. While there is great variability and no precise predictability, he said that we are probably looking at a 10 – 12 year time span progression for the disease. The good news is that we caught the diagnosis relatively early and that new medications are being developed. Also, I am in good general health. 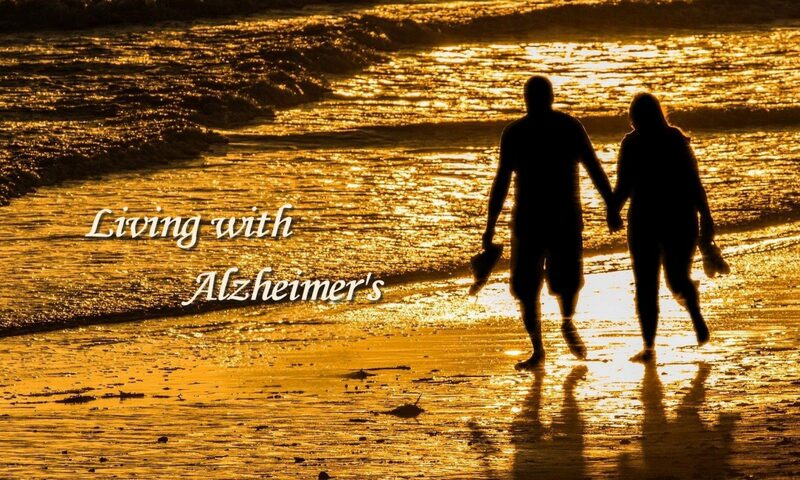 Virginia and I are walking together, and we are looking into a “memory support” group for early Alzheimer’s patients. I faithfully exercise my brain with my photo album projects and play “Lumosity” on almost a daily basis. The bottom line is that we are being proactive in our efforts to extend the cognitive quality of our lives together. We hope to have many good years left together for us and our families. I inquired about the possibilities of future aggressive behaviors on my part. Again, Dr. Smith said there are no clear predictors. It helps to start out with a non-aggressive nature, so I have that on my side. Some people become passive and withdrawn. However, there does come a time when the disease takes over and “Ken” will no longer be in charge. I saw this with Mother and her stroke-induced dementia, when she occasionally became somewhat combative and argumentative –traits I never saw even once in her normal existence. I am writing this letter so that there will be absolutely no future doubt about my feelings on this matter. If I exhibit aggressive or combative behavior toward Virginia, I want Virginia to have no hesitation to use prescription drugs to control that behavior, even if it further impairs my mental abilities. I also instruct Virginia to physically move me to a separate living facility when she decides that it is time for that to occur – and I trust her judgment on this issue. I hope that you will provide advice and counsel on these and related matters, but the ultimate decision will have to be made by Virginia. I want the decisions to be in her best interests. I have absolutely no fear of not being well cared-for, or that such a decision will be made “before it’s time”. In contrast, it is the thought of my not being removed from such a situation that scares me more than anything else – thus, this letter. Please save this letter and, if I later protest, show it to me as a reminder when the time comes. On a related matter, I want it clear that I wish Virginia to be in Wisconsin during the summers with our children and grandchildren, even if I am unable to make the trip. If I have to stay in San Angelo, she will get a well-deserved break. Virginia is not aware of this letter. I will show it to her the day after I mail it. I want you to know that I am writing this of my own volition and that she has not requested that I write such a letter. Please store this letter in your lock box or a safe place where it can be retrieved in future years – if need be. I love you all so very, very much. I also look forward to many good years in the future before we need to face the decisions outlined in this letter. Is it better to know or not to know? I am currently reading (that is, listening) to The Inheritance by Niki Kapsambelis. It is a fascinating account of two true stories. One is about the efforts of medical researchers to understand Alzheimer’s and uncover a way to prevent and/or cure it. The other is about a family that has experienced the disease over several generations. The part I read this morning deals with the family members’ opportunity to be tested for the gene that is the carrier for the disease. Most of the family chose to know. Others did not. What do you think you would do? This question led to my reflecting on our decision to find out if Kate’s symptoms were just part of normal aging or if she had Alzheimer’s. Too much time has passed for me to recall clearly when we started asking ourselves that question or exactly how each of us felt about it. I do remember that Kate wanted to know. I also recall that I didn’t have the same desire. Knowing how little there is that one can do to change the ultimate outcome of the disease, I believed we could just go on living our lives as fully as possible. I recall that by the time we initiated the process for her to be tested, we were pretty sure, but not confident, that she had dementia. Kate had been the first to notice the symptoms five or six years before. I began to notice more after she had mentioned her fear that she might have Alzheimer’s. We seem to have reached the decision to find out at the same time. When her doctor gave us the results of her PET scan, Kate said she was relieved to know. I remember that she accepted the diagnosis quite calmly. I can’t say the same for me. Immediately, I felt a deep sense of sadness. I choked up. The doctor handed me a tissue to wipe the tears. You might think that if we were already prepared for the answer the doctor delivered to us, I would have responded more like Kate. In retrospect, I think we both responded in ways that are consistent with our personalities. I remember our daughter’s having a bicycle accident when she was twelve or thirteen. As we were with her in the emergency room, it was Kate who was as steady as a rock. I don’t know that I showed it on the outside, but I was a wreck on the inside. The impact of the news wasn’t limited to that moment. Kate remained calm, but the news did take its toll on her for a short period of time after that. We talked talked a good bit in the weeks that followed. We talked about the implications and how we should respond. When should we tell our children? Our extended family? Our friends? It wasn’t long until we began to realize that there really was no impact on our day-to-day lives. We began to feel the way we did before the diagnosis, but, for me, the impact has remained as a central part of my life. I made an abrupt change in the way I responded to her forgetfulness and other symptoms of her illness. Now I understood why she was doing so many of the things she did. I became a more understanding husband. I tend to be a planner and quickly went into planning mode. As her caregiver, I haven’t stopped yet. The plans are always changing as necessity demands. I believe that getting the diagnosis was the right thing for us. Knowing was the catalyst for our taking advantage of our time together. We thought we were already doing that, but the diagnosis caused us to shift into high gear. That is how we plan to live as long as we are able. Today Kate and I met with Dr. Reasoner to get the results of Kate’s PET scan. She had gone in for the scan a couple of weeks earlier following a routine appointment with Dr. Reasoner. I went with her for that appointment to give my own impression of Kate’s lapses of memory and to hear what Dr. Reasoner had to say.